Turn Off Week began yesterday and runs through Sunday. Are you planning to pull the plug? (It's also known as Digital Detox Week to encourage everyone to take a step back from all their digital devices -- that includes computers!) Last year my family turned off our TV and survived the week. I also noticed that after a few days, my daughter didn't miss the TV at all. She was perfectly happy to play outside, do little projects and use her imagination. My husband on the other hand had a few withdrawal issues. Turn Off Week corresponds with National Park Week & the 40th anniversary celebration of Earth Day so there's plenty of screen free ways to celebrate and spend some quality time outdoors. 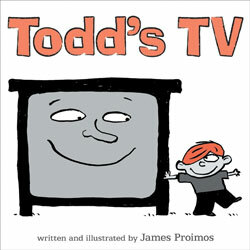 Todd's TV , a comical book about a boy that watches way too much TV, provides parents with a way to discuss the concept of less screen time with their kids. This new picture book by James Proimos releases next week and tackles the issue of excessive screen time with humor and a little sarcasm. Todd's parents use their TV set as a babysitter. Over time the TV begins to take over all parenting roles -- it plays catch, puts Todd to bed and even attends his parent-teacher conference. When the TV decides to try legally adopting Todd, his parents rethink the whole TV situation. We received an f&g (folded and gathered) review copy of this book last week. The red, white, gray and black color scheme really didn't call to me, at first. Surprisingly, my daughter is the one that gravitated toward the book, perhaps because it looks so different from most of her other books. I'm so glad she picked it up because we enjoyed reading it together and ended up talking quite a bit about TV usage in our home. Parents take note - Proimos gets the point across loud and clear in his book. The TV is not an electronic babysitter and readers will quickly realize the material in this book is aimed at both adults and children. I'll be the first to admit that I've used the TV in a pinch and for breaks. And occasional use is OK, at least in my book, especially if care is used in selecting appropriate shows. But when the box constantly and continuously blares, it's time to turn it off and look for different ways to spend time together as a family. Proimos illustrates this point beautifully in his book and also highlights the positives of using the time in different ways...well, that is until another technological device enters the home. In the end, I'm left wondering why this book isn't releasing a week earlier to correspond with Turn Off Week. Pick it up anyway next week, especially if you have kids that are addicted to TV. Most kids I know would rather spend time together reading a book rather than watching TV anyway, especially if storytime means a little one-on-one time with a beloved parent. On a side note, I may post less frequently this week as we spend more time enjoying the outdoors and participate in non-digital activities. My father is also undergoing surgery on his knee and will require some assistance, so I won't have as much time to devote to this blog for a few weeks. Turn Off Week when we're down to the final episodes of Lost? I just can't do it. Really excited to find out that it's National Park Week, though. We LOVE our Nat'l Parks! We have a no tv M-F for the kids, but I have to confess, I watch tv later in the night. Uggh, I guess I should trim my habit and not be such a hypocrite.